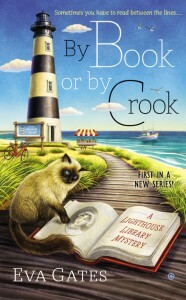 With BY BOOK OR BY CROOK, the first book in the Lighthouse Library Mystery series, author Eva Gates is off to a great start to what will be a wonderful series. The setting is this story is stellar. A library in a lighthouse on the Outer Banks? Yes! More please. Protagonist Lucy Richardson is smart and plucky. She, as well as the cast of supporting characters are sure to be favorites to readers. With a suspenseful plot and unexpected twists that kept me guessing until the reveal, this book was hard to put down. I eagerly await the next installment in this series. Ms. Gates has found a true fan in me.